CMSA (Case Management Society of America) Core Curriculum for Case Management provides the core knowledge and guidance required to provide coordinated, effective, patient-focused case management. It’s written in an easy-to-read, well-organized outline format. The text is comprehensive and speaks to the full range of nursing roles and environments. It’s an essential guide to case management issues, tools, skills, and protocols and is both a study guide for certification and a vital, keep-it-handy reference for all nursing case managers. - Discussions on the case management role in numerous settings: hospitals, community clinics, private practice, acute care, home care, long-term care and rehab, hospice, and more. The book has a great amount of helpful, topical information! I plan to review the content again! There is so much information in the textbook but the questions helped to focus on important facts. The authors Tahan and Treiger, clearly presented the material. Material was informative, objective, and evidenced based. Introductions were well structured. Material enhanced the key ideas. Test followed the book exceptionally well. The information is great! I’ve learned a lot/been reminded of some things that I’d forgotten. My CCM realm is Workers Comp – so I had forgotten some payer specific things.The book is tedious to read, since it’s all in outline form – but that also makes it organized. 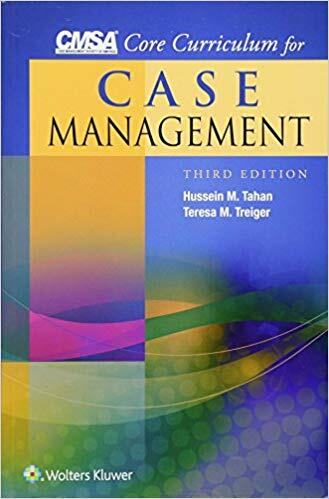 I have read plenty of books on case management and this one is the most comprehensive of all. I do not believe that any one area of case management was left out. Wealth of info – excellent desk reference for case managers. I wonder how much will change in the next few years, particularly the web addresses and organizational resources. Section on use of web is excellent – this is a crucial skill! (The book is) quite tedious, possibly off-putting for new case managers but worthwhile overall. Comprehensive, invaluable working reference for active case managers. Keeping it current could be a challenge. Wow! Section B takes case managers in to the new age. I will strongly recommend this course to all the RN case managers and CCMs I work with! Kudos!